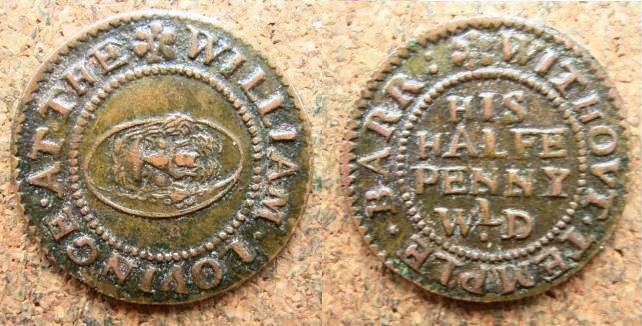 The above copper farthing measures 15.5 mm and weighs 1.00 grams. It was issued in the name of a tradesman operating from premises marked by the sign of the Wind Mill in the district of Temple Bar Without, Westminster. Obverse: (star) AT.THE.WINDE.MILL , around twisted wire inner circle, within the depiction of a open-trestle post mill. Reverse: (star) WTHHOVT.TEMPLE.BARR: , around twisted wire inner circle, a pair of initials I . P , within. The exact location of the business which issued this token is not know but presumably it lay off The Strand. The token’s issuer (i.e. Mr. I. or J. P.) or his precise trade have not as yet been identified. However, as the sign board of the windmill was often adopted by inn-keepers, brewers, taverners and occasionally bakers and mealmen (i.e. a dealer in meal or grain) it is likely that this token’s issuer had an association with one of these trades. In his book “London Signs” Bryant Lillywhite’s lists over 50 historic examples of sign boards bearing the name of the windmill, the first of which appear in the early 16th century. 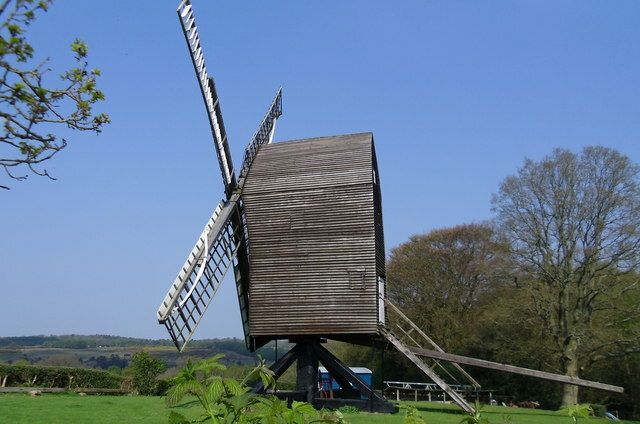 While the sign may have been adopted by certain tradesmen over time it is possible that in some cases its original use may have signified the earlier site of an actual windmill. 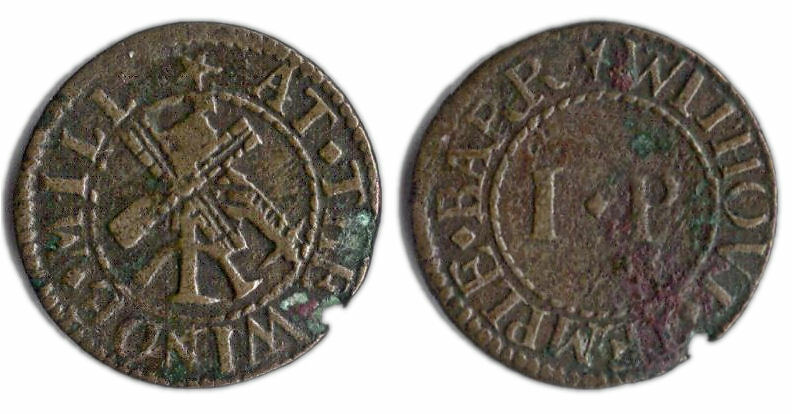 The windmill depiction on the token’s obverse clearly shows an open-tresel type post windmill. Like the one illustrated below. Such type of mill would have been common throughout Britain in the 17th century and earlier. Today there are only a handful of examples of this type still remaining in England. The above copper farthing measures 15.9 mm and weighs 0.96 grams. It was issued in the name of a tradesman operating from premises marked by the sign of the Golden Lock in the district of Temple Bar Without, Westminster. Obverse: (star) AT.THE.GOVLDEN.LOCK , around twisted wire inner circle, within the depiction of a door lock escutcheon. Reverse: (star) WTHHOVT.TEMPEL.BARR: , around twisted wire inner circle, a triad comprising I | .M. | .E , within. The exact location of the business which issued this token is not know but presumably it lay off The Strand. The token’s issuer (i.e. Mr. I. or J. M and Mrs. E.M.) have not been identified. It is likely that their business was that of an ironmonger, locksmith or smith as such tradesmen often operated under the sign of the lock. The above copper half penny measures 20.8 mm and weighs 2.05 grams. It was issued in the name of John Parrett at the Sword and Buckler in Shire Lane in the district of Temple Bar Within, London in 1667. Obverse: (rosette) IOHN.PARRETT.AT THE.SWORD , around twisted wire inner circle, within the depiction of a sword and buckler (i.e. small round shield). Reverse: (rosette) AND.BUCKLER.SHEERE.LANE , around twisted wire inner circle. Legend within, HIS / HALFE / PENNY / 1667 in four lines. 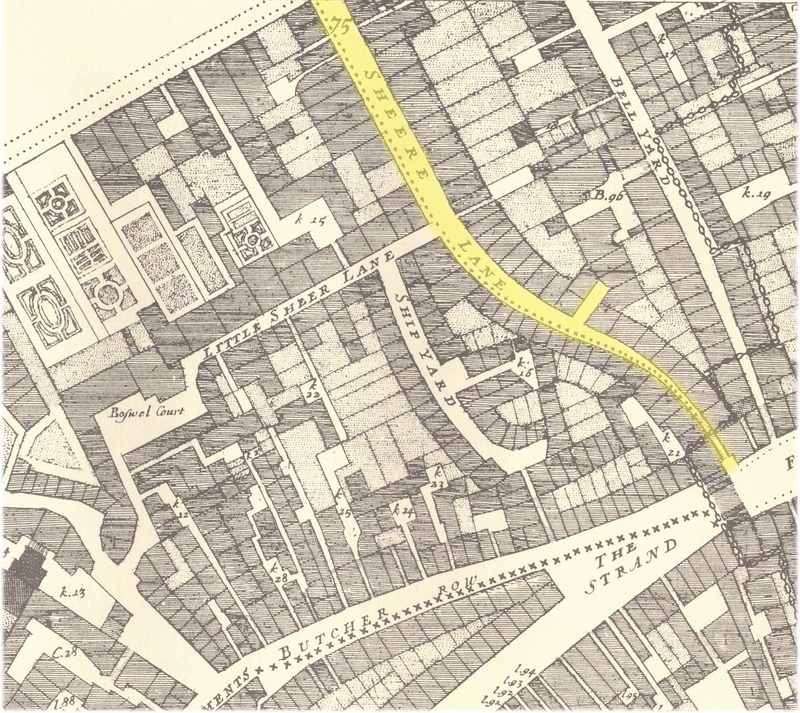 Shire (or Sheere) Lane ran north off Fleet Street from its junction with the Strand at Temple Bar. From the information displayed on his token’s we can’t tell what John Parrett’s occupation was. There is also no record of him in Shire Lane in the 1666 London Hearth Tax returns. It is possible the tat the sign of the Sword and Buckler could have been used by a tavern but this is by no means certain. The sign itself may have been an indication that buckler play or so-called sword and buckler play may have been exhibited there or near by at some point in time. 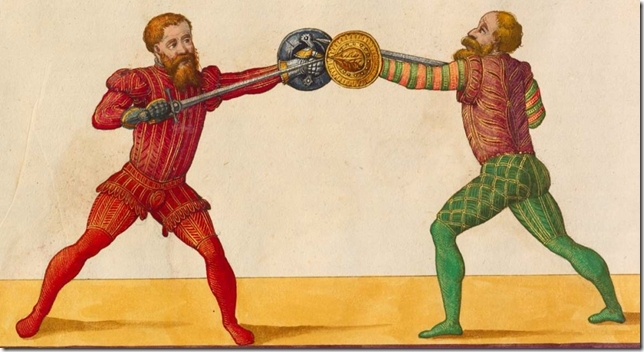 Sword and buckler play was once common in England, especially in the time of Elizabeth I. 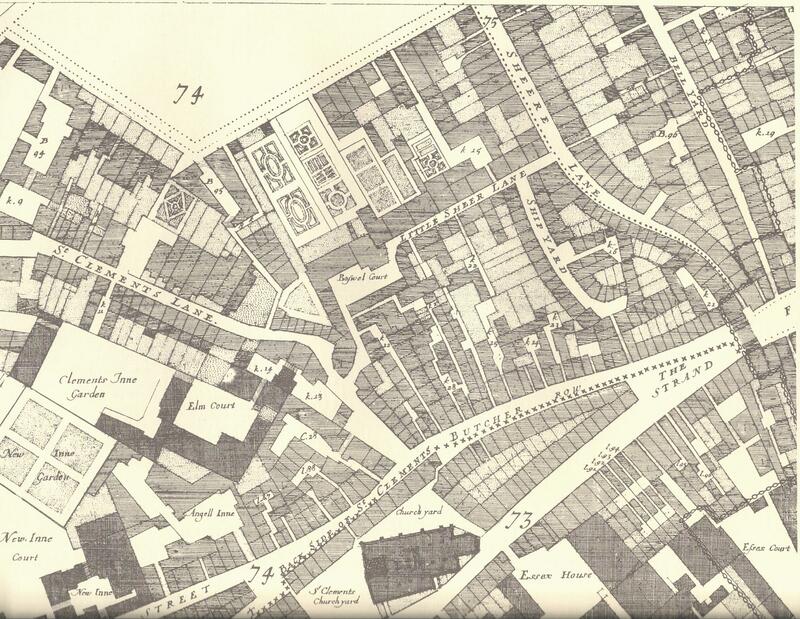 By a proclamation of 1609 buckler play, bear-baiting and the singing of ballads was banded in the City of London and adjoining counties was to be prohibited and those transgressors of the new law were to be severely punished. However, on the restoration of King Charles II licences for the pastime of buckler-play and other mischievous sports were, for the payment of a fee, made available from the Master of Revels. In the time of John Stow, the famous Elizabethan historian of the City of London, it is recorded that every haberdasher sold bucklers. Hence it is said that the device was often associated with haberdasher. The above copper half penny measures 20.7 mm and weighs 2.19 grams. It was issued in the name of the Baptist’s Head in the district of Temple Bar Without, Westminster. Obverse: (rosette) WILLIAM.LOVINGE.AT THE , around twisted wire inner circle, within the depiction of the John the Baptist’s head on dish. Reverse: (rosette) WTHHOVT.TEMPLE.BARR: , around twisted wire inner circle, HIS / HALFE / PENNY in three lines, below a triad comprising W | L. | D , within. The Baptist’s Head was a common London sign prior to the Henry VIII’s conversion to Protestantism. It is not known in this case if the sign was that of a tavern or alternative business. The exact location of the business is also not know but presumably it lay off The Strand. 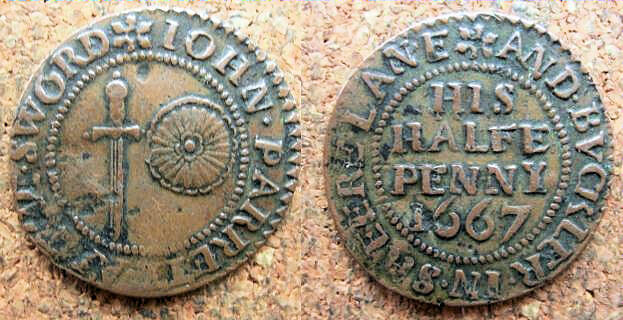 A similar token was issued John Lawton who also traded at the sign of the Baptist’s Head in Temple Bar Without. Stylistically this appears to be earlier in date than that described above which most likely dates to the period 1665 to 1670. Thomas Springall of the Castle Tavern in St. Clement’s Churchyard.